This is a full evening one-man show, an educational and entertaining lecture lavishly illustrated with a dazzling array of clips from 100 silent films! It is divided into film sections with Rob’s live commentary in between, covering the genres of Slapstick, Romantic Comedy, Adventure, Foreign Drama, American Drama, and Comedy. The intent is to shed new light on the acting style of the silent era while giving modern audiences a fresh and entertaining look at the talents of the silent stars. It is a celebration of the art of physical acting—what Rob’s mentor Marcel Marceau called the “silent language of the soul“—seen through the lens of silent cinema. The program is suitable for film festival, college film and theater departments, high school, lecture series and theaters. Also available: a Master Class or residency on the Art of Gesture to accompany the film program. When the Green Mountain Film Festival invited me to create a special live program on Silent Film, I decided to focus on how the vocabulary of theatrical pantomime was adapted to film technique. I also had some association with Buster Keaton’s manager and silent film collector Raymond Rohauer, who showed me rarely seen home movies of the silent stars. During a long Vermont winter I watched 100 silent features—dramas, epics, adventures, comedies—with a keen focus on acting styles. No TV, no modern films for four months: it was pure delight! From the silly to the sublime, the passionate, often majestic films revealed an engaging artistic integrity. But I found it takes time to fully embrace the world of the silent cinema, to become accustomed to its conventions and rhetoric of gesture. 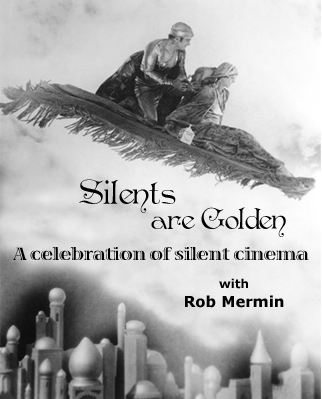 The result of those 100 Silent Nights and 9 months of research and film editing is my one-man “Picturesque History” show Silents Are Golden, commissioned by Focus on Film to premiere at the 2007 Green Mountain Film Festival. Since then I have taken the show to several countries. I love presenting this program: it’s like bringing adults to the circus for the first time in decades and watching a childlike wonder and delight return to their faces. This is a laugh-filled, multi-generational program perfect for the whole family—young, old, and in-between! 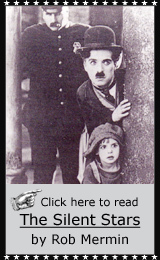 Rob compares the pantomime styles of the great silent stars, and shows a dazzling array of clips featuring: Charlie Chaplin, Buster Keaton, Laurel & Hardy, Harry Langdon, Harold Lloyd, Keystone Kops, and more!